Yes, you read that correctly! Don't worry, there was a non-alcoholic punch on there. I co-hosted a shower at my apartment this past Saturday and I'm going to be sharing the details with you this week. Starting, as usual, with the bar cart! The mother-to-be chose fuchsia, navy and gray as her colors, signifying that the baby's gender is a surprise. I love this modern twist on the classic baby blue and pale pink. Especially as fuchsia and navy were my wedding colors! The tissue paper wheels are from Pom Pom Sale on Etsy. They were easy and inexpensive, and made a big impact. I love the pop of color they add to the background - I might just keep them up for a few weeks. The ribbon wands to the left are a DIY project that were used at the conclusion of our wedding ceremony. 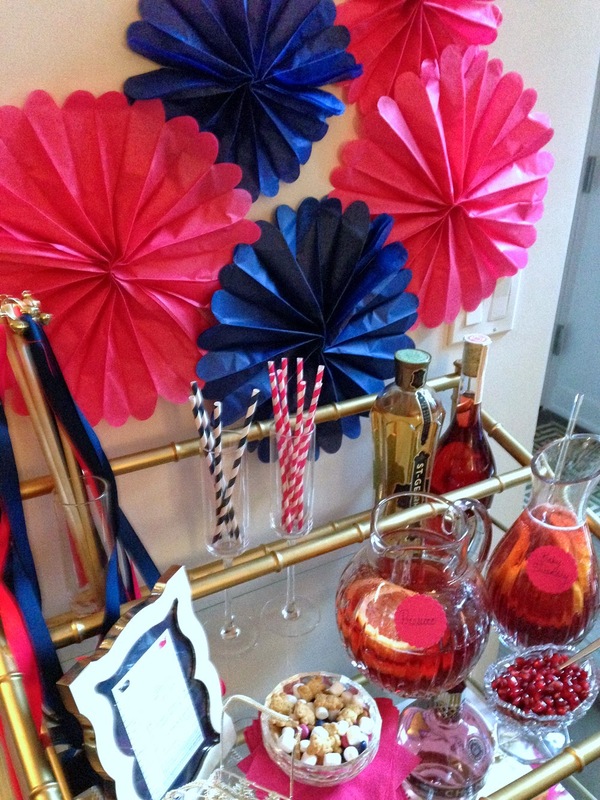 The paper straws are from Shop Sweet Lulu. 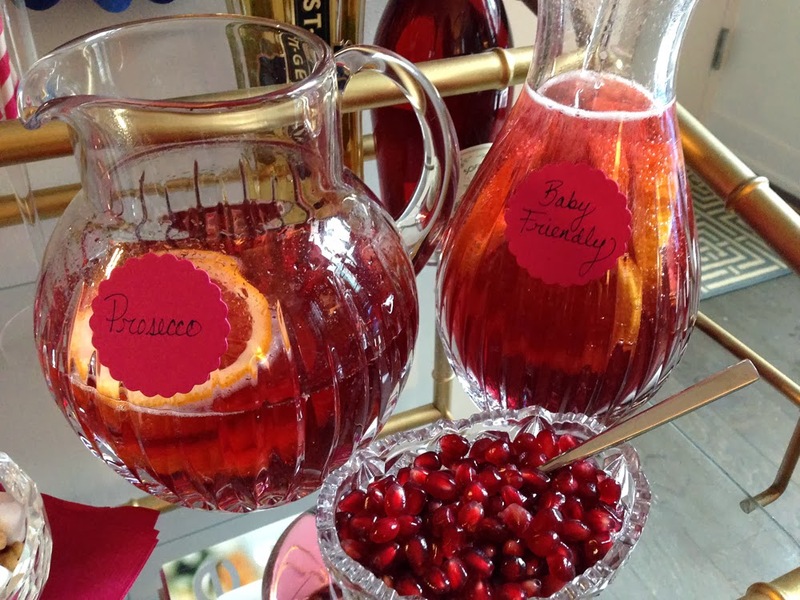 We served two pomegranate punches - one with prosecco and one with sparkling water, which we labeled "Baby Friendly." 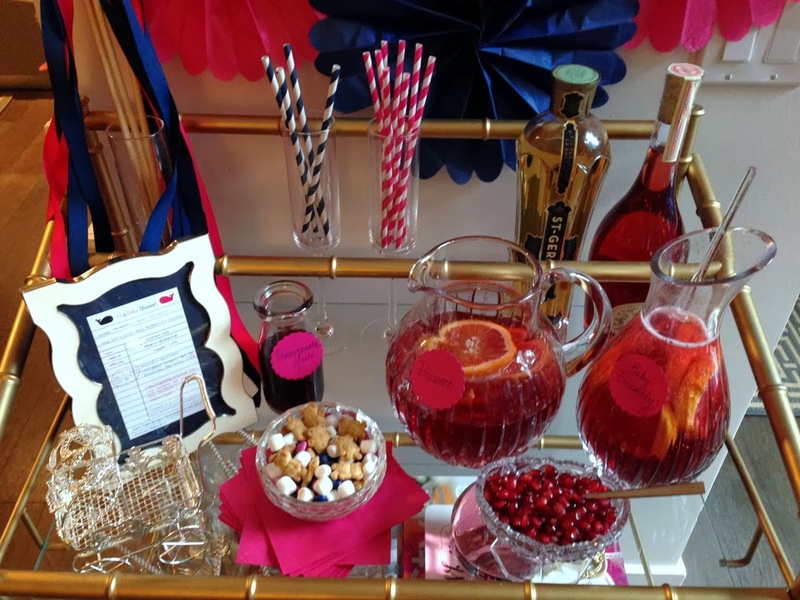 Pomegranate seeds went alongside the punches for guests to spoon into their glasses. 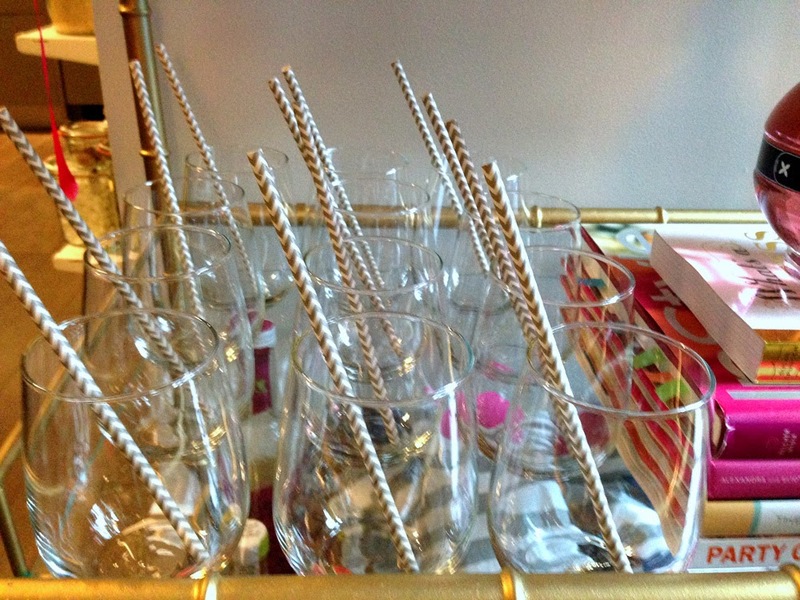 I dedicated half a shelf to glasses with straws so that guests could help themselves. These gray chevron straws are from Designs at 35 on Etsy. The stemless wine glasses are from Crate & Barrel. We bought 2 sets of these glasses to use for entertaining, which especially come in handy when it's warm enough to use our terrace. I think these are the perfect alternative to disposable plastic cups - they aren't expensive ($20 for a set of 12), they're obviously not as wasteful as plastic, and I think it's nice for guests to drink out of a real glass. This isn't college, after all. 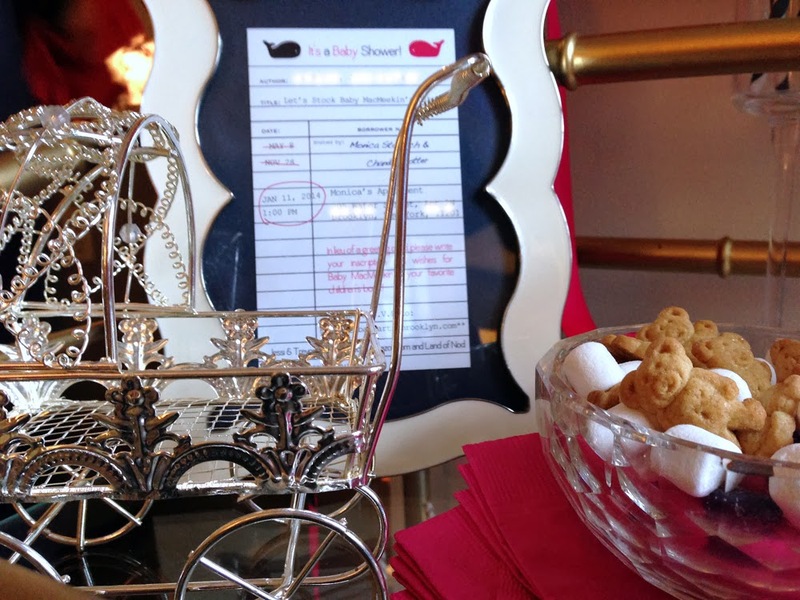 How adorable is this little baby carriage? It was hand made by a shop called Forever Sweet Favors on Etsy. It's actually a cake topper but I loved the way it looked here on the bar cart. The "Enamel Queen Anne Frame" is from Jonathan Adler. The invitation (mother's name and my address blurred for privacy reasons) was designed by Carissa Nee Designs. If you're in the market for custom invitations or cards, check out her site - she is super talented and fun to work with. The Teddy Graham "s'mores" mix was probably my favorite element - I borrowed it from Ninah's Instagram - we'll go over that and the other food items tomorrow!